A world ravaged by civil war comes to a cataclysmic end as Voden, serpent of the void, is summoned to destroy the world. Who would do such a terrible act, and how can it be prevented? 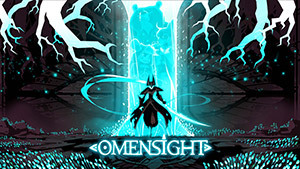 Omensight is a Groundhog Day-esque adventure in which you, as the silent yet powerful Harbinger, repeat the world’s final day in an attempt to discover a way to prevent the end from coming. The Godless-Priestess is dead. Murdered by an unknown hand, her death sets in motion the coming of Voden and with it, global annihilation. You play as the Harbinger, a mysterious entity destined to return to the world in its darkest times, as you attempt to direct the machinations of key characters during the final day to prevent Voden’s arrival and ultimately save the world. Hurtled back in time to the start of the last day, you’ll be tasked with approaching and persuading various characters with helping you uncover the truth of the last day, accompanying them as they continue their final tasks in the hope of learning some vital new information about situations or characters. Once the day is over you’ll return to its dawn, armed with new knowledge and another opportunity to try new paths or plans of action with your choice of companion. Each major character has their own agenda which you’ll need to work around or manipulate to your own end. Emperor Indrik leads the charge of a united Urralia, seeking to unify the nations of Pygaria and Rodentia under his empire, with his trusted general Draga sworn to uphold Indrik’s wishes to the end. Opposing Indrik is Rodentia’s fiesty rebel leader Ratika, who is vehemently against the Pygarian push for union, while an angry Ludomir prepares to take down Indrik directly. You’ll learn a lot about each of these characters as you interact with, support, or antagonise them, learning and appreciating the depths which they hide behind stoicism and frivolity. As you make headway into the truth of the tragedy and gather more intel, you’ll be able to refer to the investigation orb, a screen which keeps track of key clues you’ve uncovered and vital information that helps place characters and their motives. Notably, this can be disabled at any time by changing between multiple tiers of difficulty for both sleuthing and action; if you’re more of a cerebral gamer, combat can be left at normal but clues disabled with the “True Detective” setting — which I wholeheartedly recommend for first-time playthrough — while action aficionados who prefer the visceral challenge of tough combat instead of figuring where to go next are equally well catered to. The act of replaying days is smoothly handled, and the developers — previously of Stories: The Path of Destinies — have learned the lesson of letting cutscenes be skipped through, alongside a wonderful feature: when returning with new information or tools to a character who you’ve already spent the day alongside, the game will give you the option to skip past everything up until where you can utilise your new choices and explore fresh outcomes. It’s a small quality of life feature, but one that saves a lot of time and frustration. 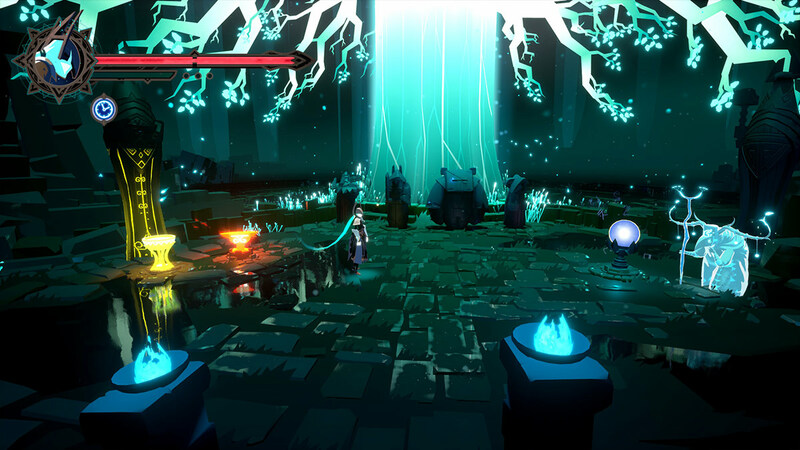 The bulk of Omensight is 3D platforming and adventuring, running through relatively linear levels with new paths and discoveries available as you progress. Most of this is straightforward fare, though the combination of 3D platforming and static camera can lead to the occasional frustration of accidently jumping off a ledge to your doom or struggling to find the way forward. Thankfully, problematic areas are few and far between — most of the difficulty is, rightfully, with the combat. If you’ve touched an Arkham game in recent years, or even Omensight‘s spiritual predecessor of Stories, then combat will feel fluid and natural: Aiming towards an enemy and hitting an attack button will zoom over towards them for an immediate, deft strike; incoming enemy attacks are signified by large exclamation points and, just like the aforementioned games, you can quickly dodge out of the way to avoid the attack and leave the enemy vulnerable. 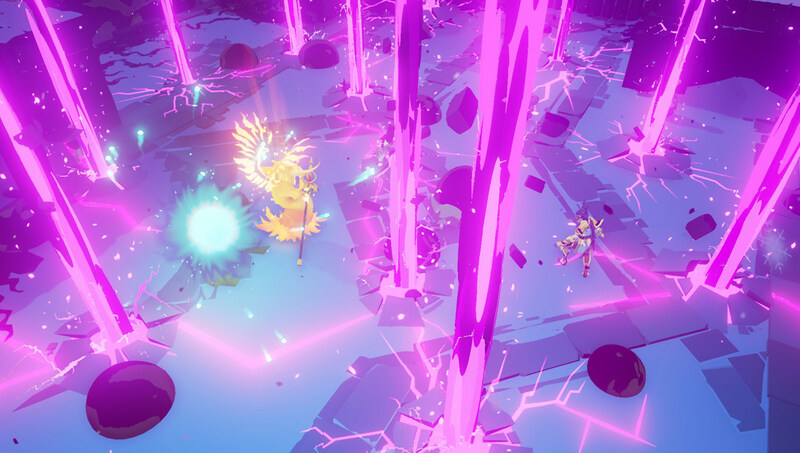 Coupled with abilities gathered as you level up, such as slowing time in a bubble or flinging energy blasts at foes, the combat feels fast paced and dynamic, a cavalcade of perfectly timed weaves and strikes until all around you are felled. Combat feels rather well tuned too, with the majority of encounters feeling tough but fair. Bosses are as difficult as you’d expect, with learning curves for their mechanics and how your own abilities may (or may not) affect them, and make for memorable fights. I found a couple of frustrating sequences that repeatedly resulted in a number of fails, primarily one that relies on rushing and having to break the habits you’ve built up until this point, though these grievances are rare and didn’t significantly impact my enjoyment of the game. The game also has a number of wonderful, subtle touches that show how developer Spearhead are vested in the game, from seeing Voden’s corruption spread insidiously over time to visual upgrades to the Harbinger’s blade and armor as her strength increases. 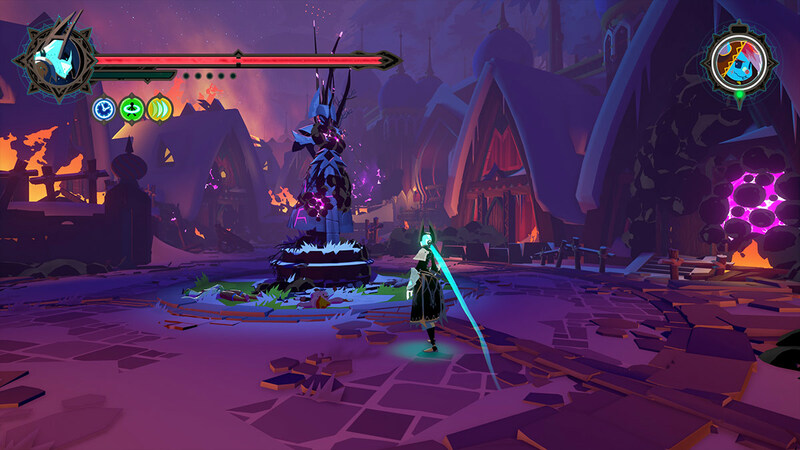 Omensight offers a relatively short experience, but one that’s rich and full of the usual interesting twists we’ve come to expect. The game feels like a maturation of the development team, taking the dynamics of time manipulation from Stories and building a darker, more somber game which explores themes of oppression, unification, defiance and despair — a game where everyone believes they’re the hero, despite the tragedies ongoing around them. 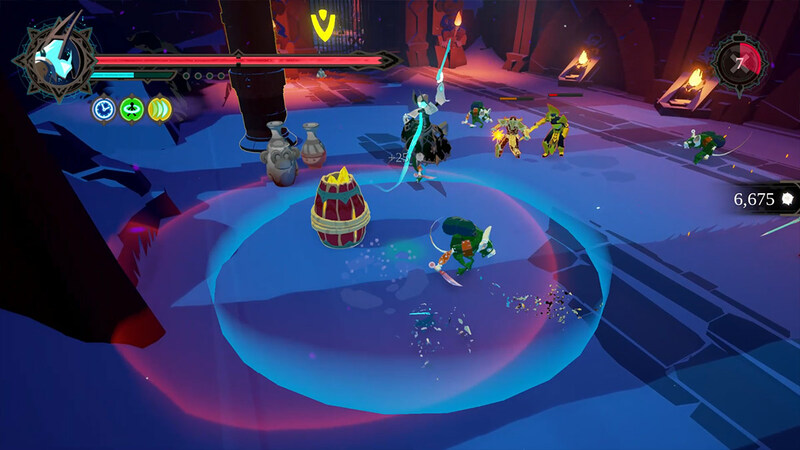 If you’re looking for an entertaining adventure that manages to hit the right notes, making you smile before saddening your heart, then Omensight is a fine choice indeed.